US scientists upto mischief on the eve of climate change talks? The politics of climate change negotiations has yet again surfaced in the scientific domain. Just as the 10th conference of parties of the United Nations Framework Convention on Climate Change begins in Argentina, December 6-17, 2004, us scientists have claimed that haze and dust from industrial activity blanket low-lying regions of eastern China and northern India. Their claim is based on images of two satellites -- Aqua and Terra -- launched by the National Aeronautical and Space Administration (nasa). 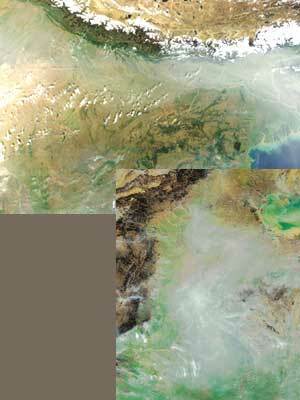 Aqua, which captures images in the afternoon, took the picture of eastern China on November 17, 2004, "showing a gray haze hung over the coastal plains around the Yellow river and the Yellow sea". As per nasa scientists, the smog is churned out by the country's coal-fuelled power plants and vehicle exhaust. "This type of haze is common in many parts of China," says Jon Ranson, a scientist at nasa's Goddard Space Flight Centre. Terra, which captures images in the morning, took the picture of haze along the foothills of the Himalaya on November 15, 2004. The haze is said to spread from the southern parts of the Bay of Bengal to the mouth of the Ganga river. But it clears over the Tibetan plateau. "The Himalayan mountain range acts as a barrier and keeps the smoke out," explains Ranson.